It’s that time of year. The time when you contemplate ripping your ears off if you hear another holiday tune. 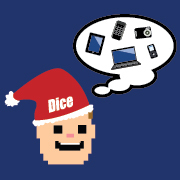 Well, we suggest keeping those hearing orifices so you can listen to this: It’s Dice’s second annual tech holiday wish list sweepstakes on Facebook. The time where we celebrate what it means to be a geek by giving you an opportunity to tell us what gadget has you drooling. We’ll pick five winners and clean up the drool. And get you that thing you want. We do think you’re all awesome, so the first 1,000 people to submit an entry will get a mega-awesome, super useful cell phone screen cleaner. Not because we think your phone is dirty, but because we know it is. And since it’s the season of giving, we’ll match the gift value, up to $2,500, to further the education of future tech pros through a donation to math and science programs via DonorsChoose.org. We want to celebrate you, and the future version of you, this holiday season. And yes, the sweepstakes is subject to certain terms and conditions. If you care for some light reading, they can be found here.